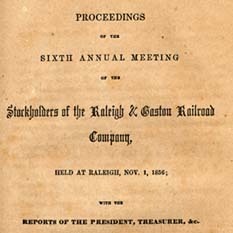 Raleigh and Gaston Railroad Company Proceedings of the Sixth Annual Meeting of the Stockholders of the Raleigh & Gaston Railroad Company, Held at Raleigh, Nov. 1, 1856; with the Reports of the President, Treasurer, &c.
Proceedings of the Sixth Annual Meeting of the Stockholders of the Raleigh & Gaston Railroad Company, Held at Raleigh, Nov. 1, 1856; with the Reports of the President, Treasurer, &c.
Raleigh: Holden & Wilson, 1856. Railroads -- North Carolina -- Management. Raleigh and Gaston Railroad Company -- Finance.